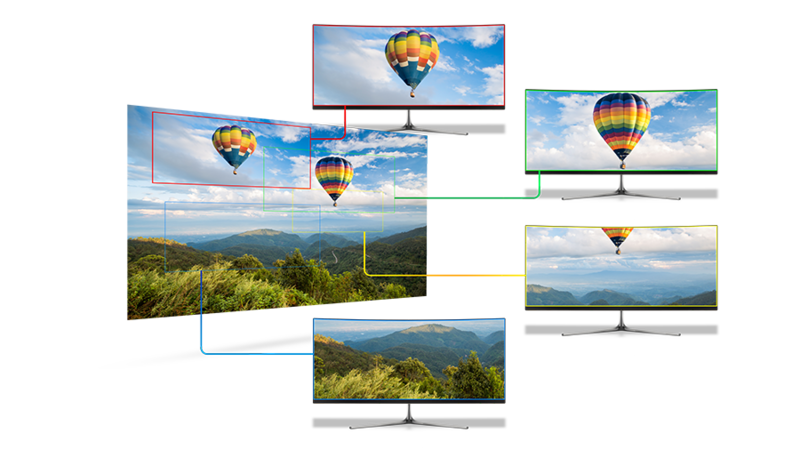 MVP-100 is an advanced video converter which allows conversion of UHD input signals into 4 different streams with resolution up to FullHD. Each device has two UHD inputs which are working simultaneously. their transition mode (single, loop, ping-pong). During the motion, every window can change its size. This feature simulates the digital zoom. MVP-100 is an advanced video converter that allows processing and conversion of UHD signals (3840×2160), for example: 12G SDI or HDMI 2.0 into four or eight different high-quality streams, at resolutions up to FullHD. MVP-100 has got two independent conversion channels! 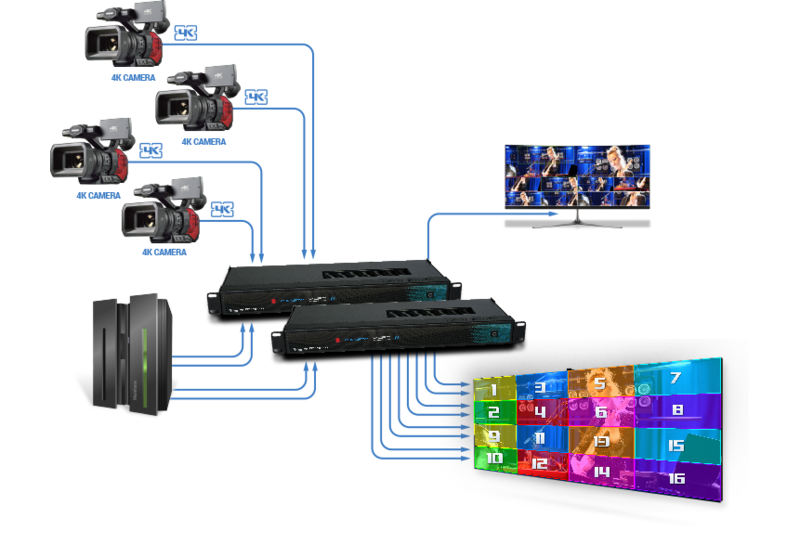 This enables simultaneous and parallel processing of two UHD signal sources – 3840×2160, the input signals are converted into eight 3G SDI outputs, which can be additionally synchronized to a Genlock input. This solution is ideal for professionals who deal with production and broadcasting of video materials using a variety of sources and signal types. It is perfect to apply both on the set and during the life coverage of events. In addition, MVP-100 converter is really easy to use. The small size of the device, its user-friendly interface. 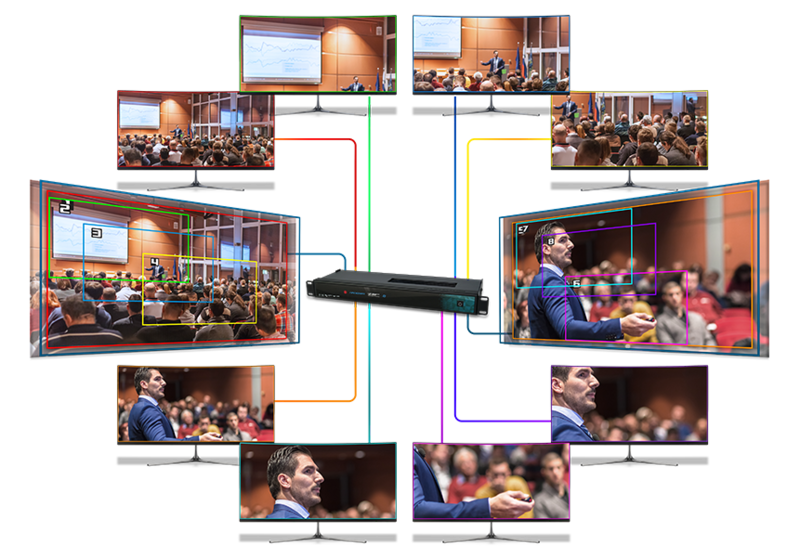 If you are holding a conference, you can cover it with two 4K cameras’ wide angles. 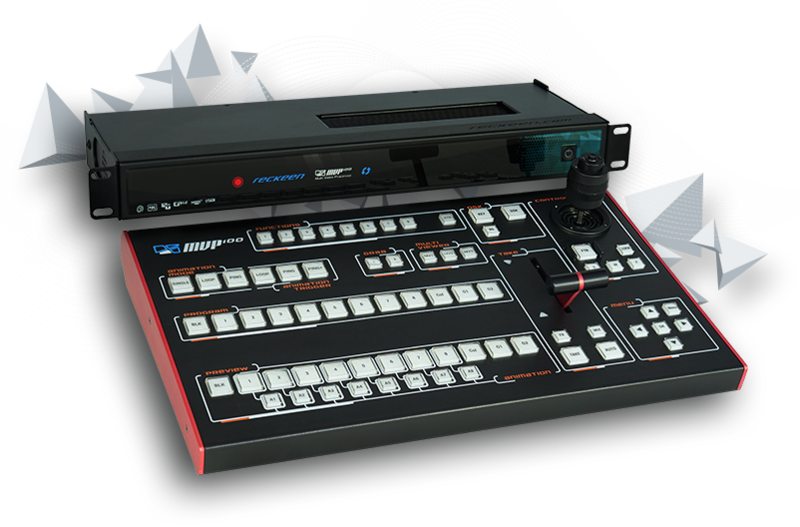 You can mimic a multicamera live production using only two physical cameras. This innovative concept requires a lot less manpower and hardware costs compared to a traditional production. More flexibility, more mobility and more camera angles! 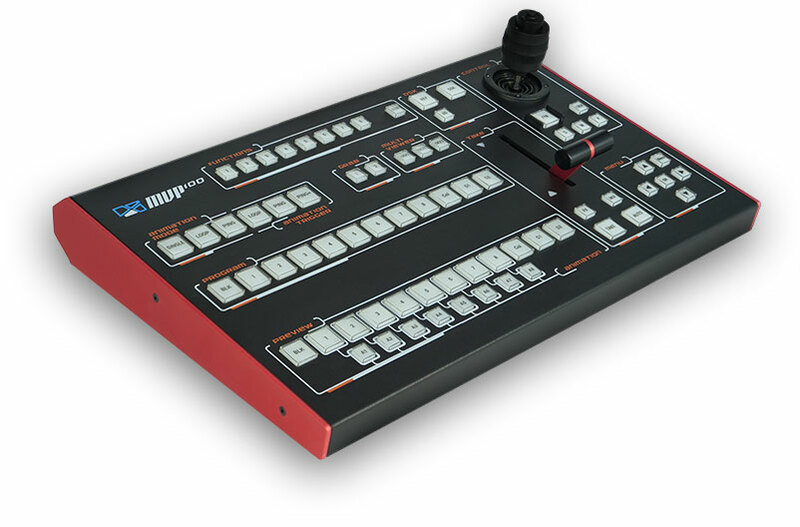 MVP 100 can be used as a switcher during a live production to make your program more dynamic. You can choose a wide angle, but also a shot of each person in the studio. When one person is talking, all you need is to switch to the right shot and zoom in or out. No cameraman is needed! You have a complete control over your live production. 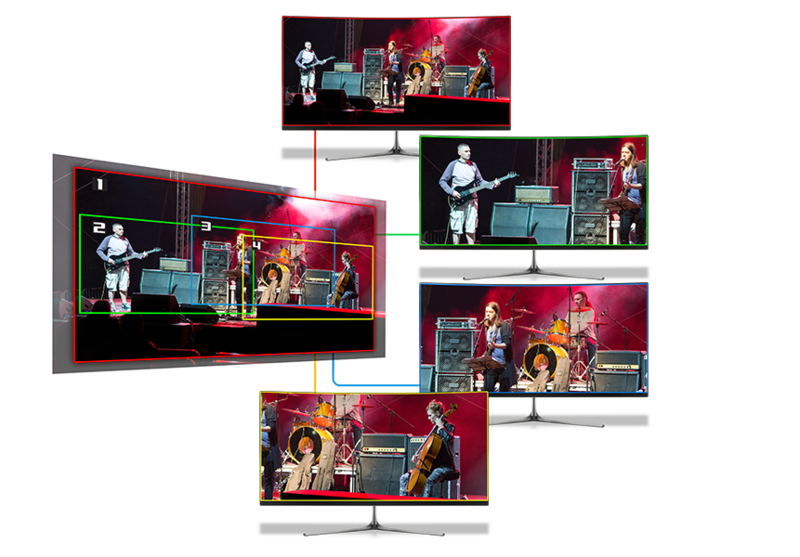 MVP-100’s capabilities are perfect for, among others, video image postproduction. The material is recorded with one or two video cameras at 4K resolution. With MVP-100, you can not only change the composition, but also the shots. The end result will resemble the usage of several cameras, and, with your mixer’s help, the transitions between them will be smooth and natural. At the same time, this solution allows for the material to be realized by a single camera operator – thus allowing the reduction of production costs. And the resulting material will still be of a high quality and FullHD resolution, as if it was realized by several operators. Video walls are a modern and increasingly popular solution used in entertainment, advertising, marketing, and special events. 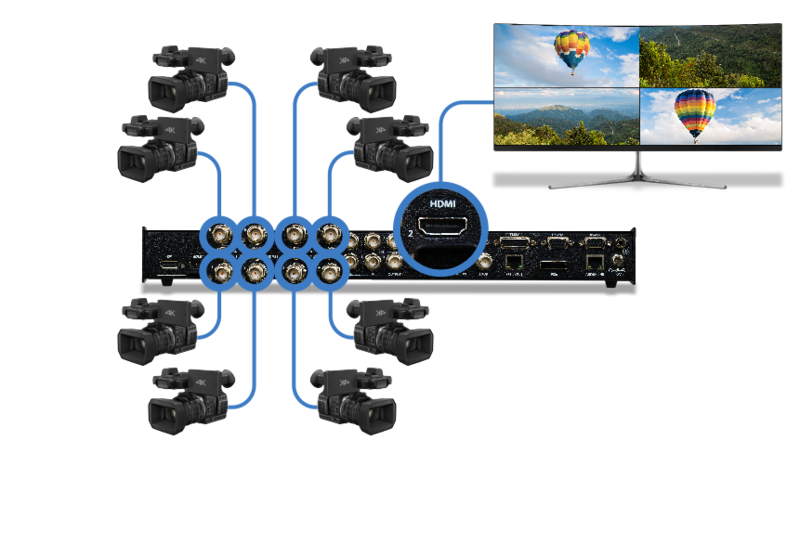 With its capability to separate the signal from 4K inputs, MVP-100 converter is an excellent tool for creating a video wall by multiplying the signal from one or two 4K sources. And a video wall created with two MVP-100 devices attains a resolution of 8K! MVP-100 is an invaluable tool in creating a top-notch security systems. It allows you to get eight 3G HD outputs from a single 4K camera. As MVP-100 processes the signal in real time, you obtain the effect of 8 high-quality mobile video cameras – but without their actual movement. This way, the converter provides both new opportunities and the possibilities to cut down the costs by reducing the number of actual video cameras and cables, while simultaneously increasing precision and quality in capturing all the important details. 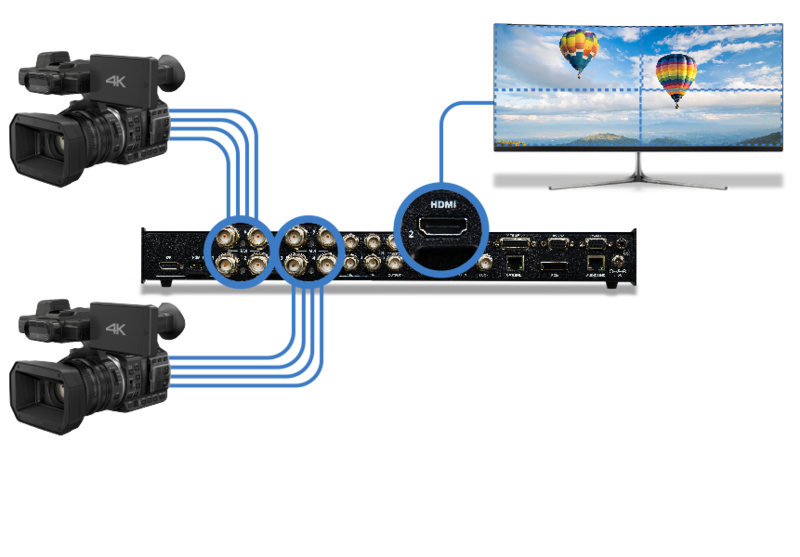 MVP-100 is able to simultaneously convert signals from two video inputs with resolutions up to UHD (3840×2160). 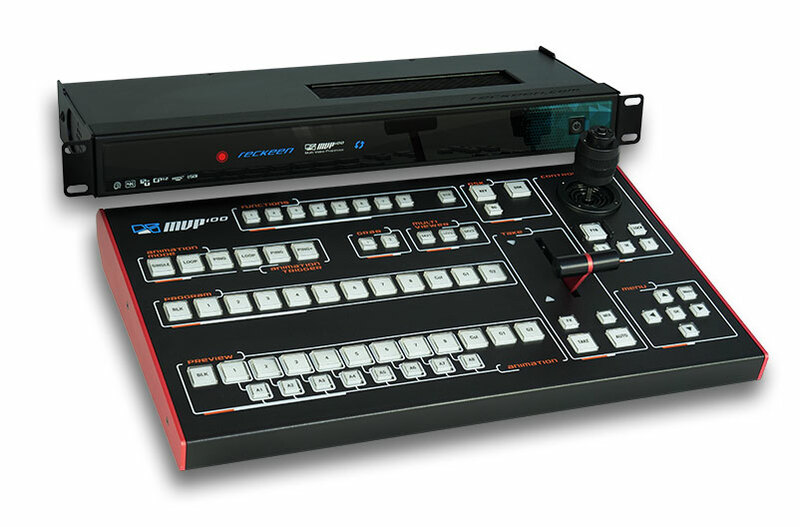 It supports a variety of video formats and enables the connection of signal sources in the form of SDI and HDMI, including 12G SDI and HDMI 2.0 technologies. The output signals are as many as 8 channels. They are created for each channel by indicating an active area from the area of the device’s input signals. The definition of the area, which will determine the output content, is nothing more than a simple positioning of a rectangle in the MultiViewer preview for a given channel, and that, of course, against the background of the device’s input signal. Each of the rectangles is marked with a white frame, but if it is selected in the program row it is red or in the preview, then it is green. For one of the channels you can scale the signal from full 4K resolution to FullHD, and there is up and down scaling (zoom) possible for all other outputs. The output area (position of each rectangle) may be a function of a variable, which means in constant motion. For each rectangle, there are simple motions available, you just need to select one of the available modes. The scope of all the settings and the end positions are defined in the application in a user friendly interface. The areas defined by the rectangles create 8 SDI outputs ( 2×4 or 1×8 ) . Multiviewer (HDMI) output is used for preview and for device’s configuration. The device also has an HDMI output Program that shows one of the frames or the transition effect between them. 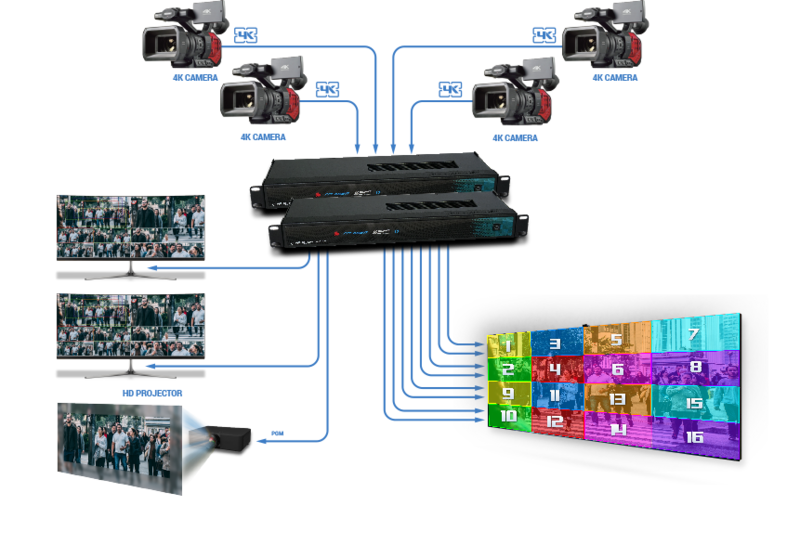 MVP-100 means multiple applications and uses, as this device allows for a variety of effects that will satisfy every professional engaged in production, broadcasting and also events’ live coverage with the use of audiovisual materials! HDMI port in standard 2.0 mostly used in cameras which can transport up to 3840 x 2160 resolution in frame rate 60 progressive. The second way is to use one coaxial cable for two inputs with BNC connector as SDI digital interface standard with supporting 3G/6G/12G signal. Some of the professional equipment, for a transport 4k signal, uses separate 4 coaxial cables with BNC connector. This method is called as Quad SDI. Each of them transports 3G signal. One of the possibilities is to connect 8 independent SDI signals at a resolution of up to 3G. At this time, it will not be possible to set virtual frames for each signal from the camera.Each full screen image will be available by pressing the button available on the MVP control panel. Clone is a function that gives you the ability to set exactly the same content on your channel as on the second input channel. For example, if you connect the 4k signal to channel A and set clone function on channel B, you can expect not only 4 Virtual frames but up to 8 with full animations. We support 8 SDI input with 3G format. 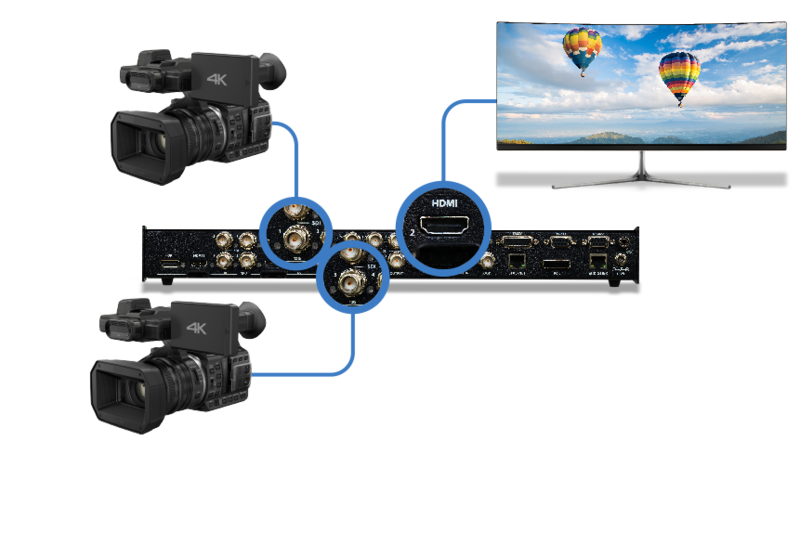 Every 4 x 3G SDI input can be replaced by single 4k input. 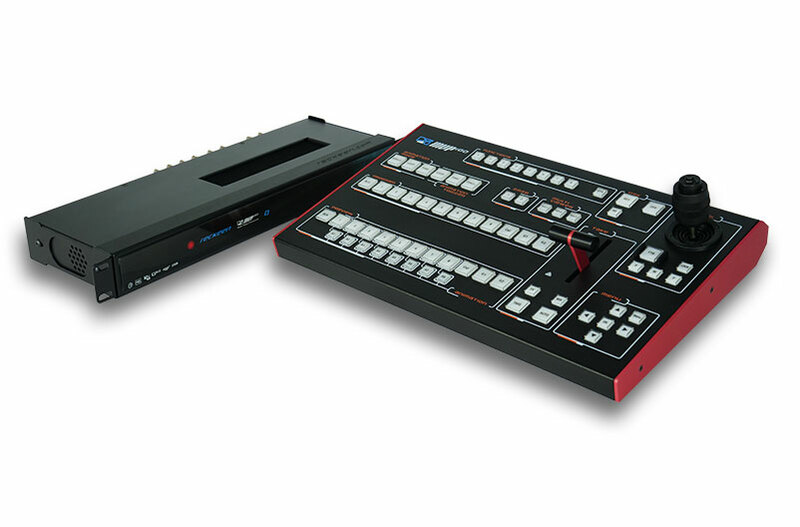 You can selected form 8 SDI input up to 2 as HDMI with supports up to 4k format. Trigger in MVP-100, that is windows’ motion control (a virtual camera). You can program up to 8 windows, each with a different type of motion (single, loop, ping-pong, zoom etc.). Communications port for controlling Reckeen External Control Panel MVPkey 100 with Joystick and T-bar. We will support 1080i, 1080p, 2160p and 50 or 60Fps as well, with auto detect functions. 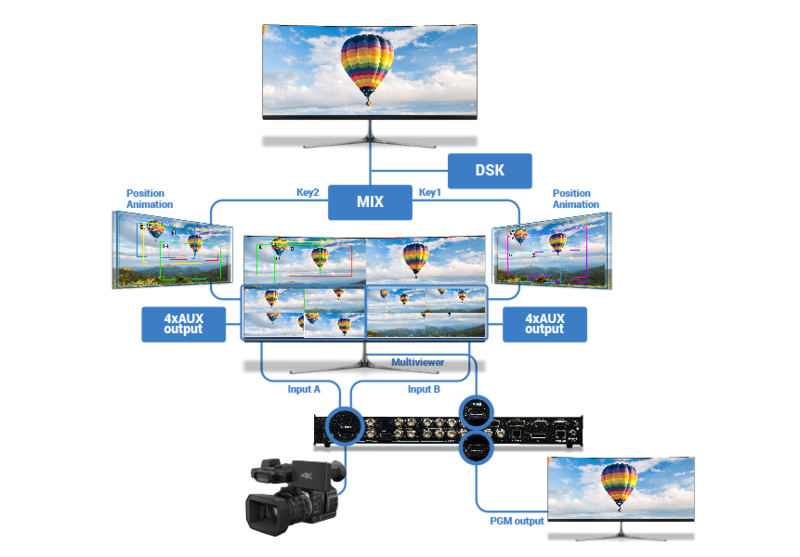 You can mix 4k input with 4 x 3G SDI inputs. High quality 4k scaler on each of the 4k inputs. 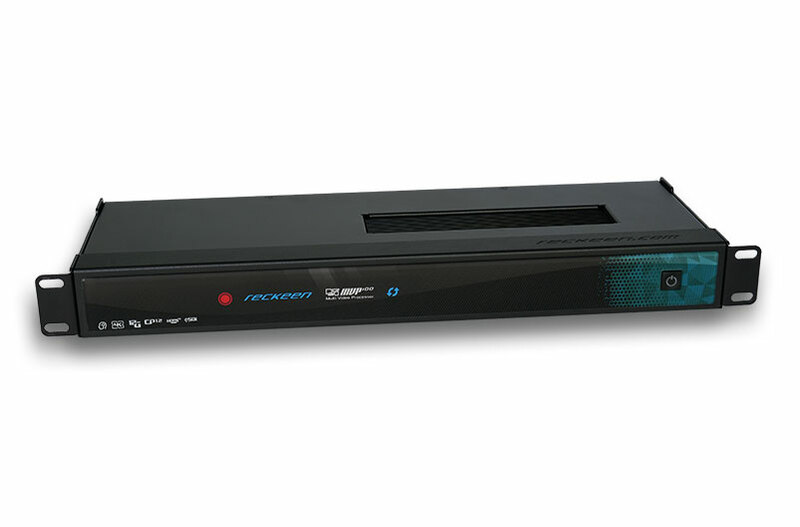 High quality Full HD scalers on each of the Full HD inputs. 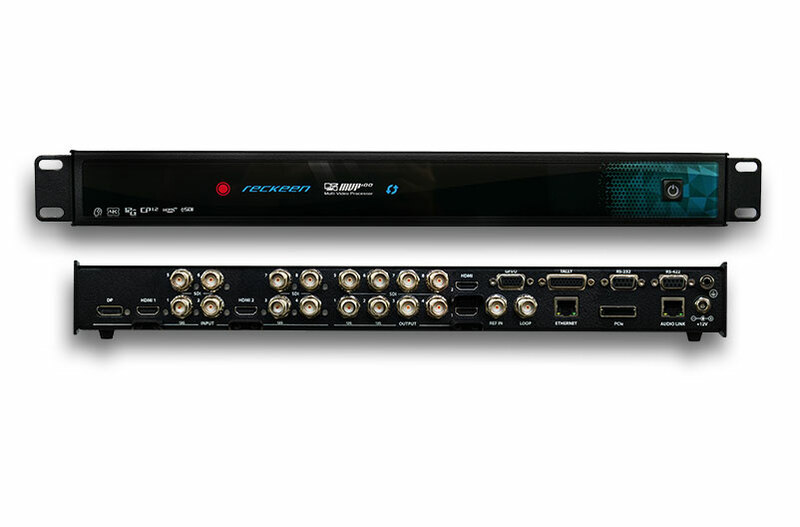 Embedded stereo on each SDI and HDMI input. Gigabit Ethernet LAN , for update firmware’s or communications with the MVP100 devices. Allows you to set the colour on the input. Grab or download still via LAN. The LEDs’ colors indicating current signal format on inputs. 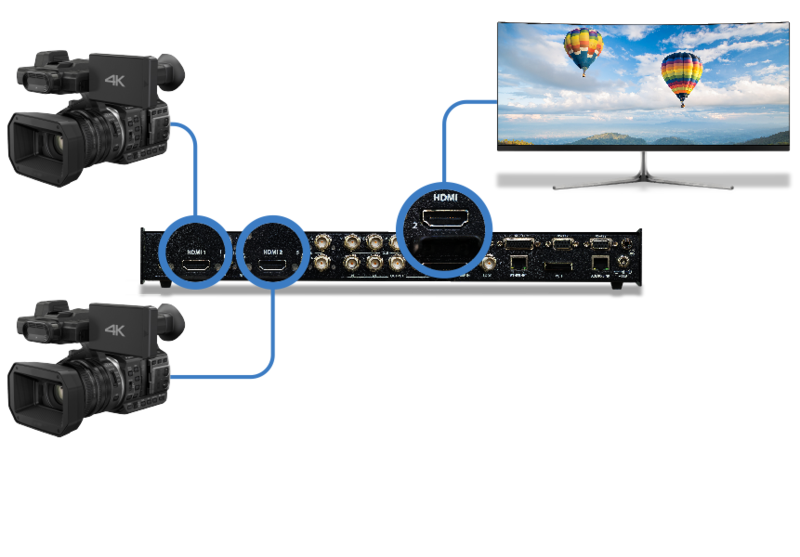 Embedded stereo on each SDI and HDMI output. Any one can be set as PGM, PVW or AUX and Clean Feed. One is MultiViewer, the second HDMI is always PGM. There are 3 layouts, predefined without config. OSD menu to board configurations on MV output. The intermingling of audio sources at the video transition. GPIO (General Purpose Input/Output) is an interface used for communication between MVP-100 system components and various peripheral devices. An external device can activate a trigger in MVP-100. Support T-Bar/Auto – effects as dissolve, effects from list selected from menu. It allows the device’s configuration and saving presets in the device’s internal memory. External port to control MVP devices via commends. Reckeen external audio port RJ45. Allows the specification of the reference signal for output channels synchronization. MVP is an invaluable tool in creating a top-notch security systems. It allows you to get eight 3G HD outputs from a single 4K camera. 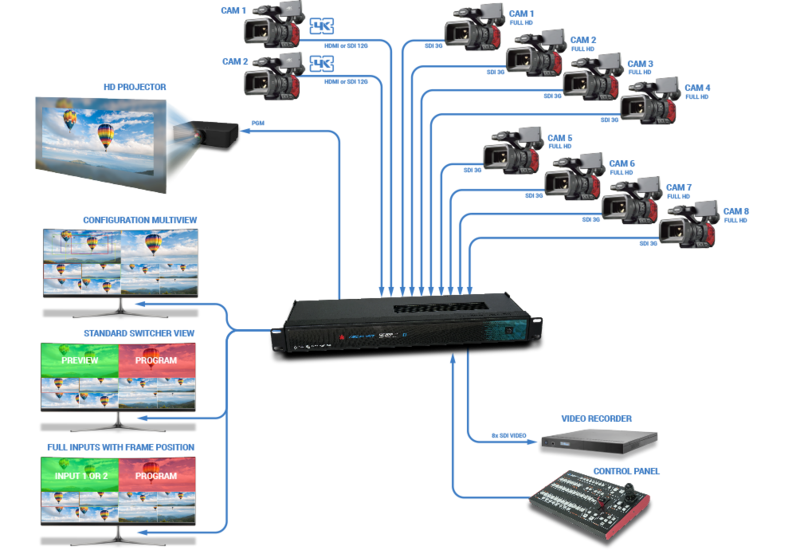 As MVP100 processes the signal in real time, you obtain the effect of 8 high-quality mobile video cameras – but without their actual movement. This way, the scaler provides both new opportunities and the possibilities to cut down the costs by reducing the number of actual video cameras and cables, while simultaneously increasing precision and quality in capturing all the important details. For a period of one year from the original date of purchase of the product, RECKEEN equipment is guaranteed against any manufacturing defects. The original purchase receipt or invoice or other documentary evidence is required. To obtain warranty service, you must deliver the product, in either its original packaging or packaging affording an equal degree of protection . You cover all mail , delivery , transportation and insurance costs. It is your responsibility to backup any data, software or other materials you may have stored or preserved on your unit. It is likely that such data, software, or other materials will be lost or reformatted during service and RECKEEN will not be responsible for any such damage or loss. Our warranty doesn’t cover damage caused by accidents or unauthorized modifications, installing any other software and repairs, misuse, sand, grit or water. All other claims of any nature are not covered by this warranty. This Warranty is valid only in the country of purchase. Repair or replacement as provided under this warranty is the exclusive remedy of the consumer. RECKEEN shall not be liable for any incidental or consequential damages for breach of any express or implied warranty on this product. except to the extent prohibited by applicable law, any implied warranty of merchantability or fitness for a particular purpose on this product is limited in duration to the duration of this warranty. Accessories ,such as the battery or the cable, are excluded from the warranty. These terms do not affect your statutory rights.